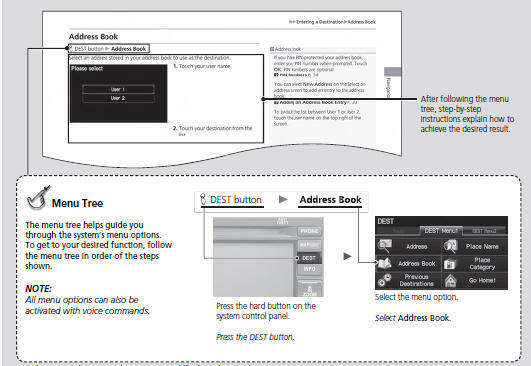 This section explains different methods on how you can easily find information in this manual. 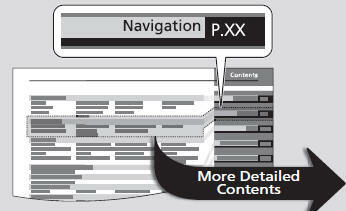 Two types of Tables of Contents help you find your desired information. 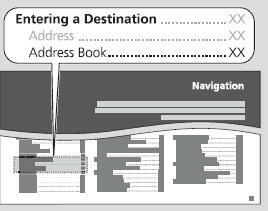 First, find the general chapter related to what you are looking for (e.g., entering a destination from the Address Book). Then, go to that chapter to view a more specific table of contents. This more detailed table of contents shows you exactly what information is listed by section and title. Menu items displayed on the navigation screen (e.g., Address Book) can be found individually in the Index. The Index consists of main terms and subentries. The sub-entries help you get to the desired page depending on what you are looking for. Sample pages and images in this section may differ from the actual ones.